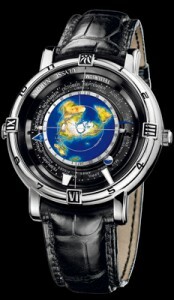 This spectacular watch shows the earth in its true geographical shape as seen from North Pole. It reveals the part of the earth lit by the sun to indicate time and place of sunrise and sunset. While the moon rotates around the earth the dragon hand indicates the eclipses of the sun and moon along with the perpetual calendar which completes 1 turn each year.